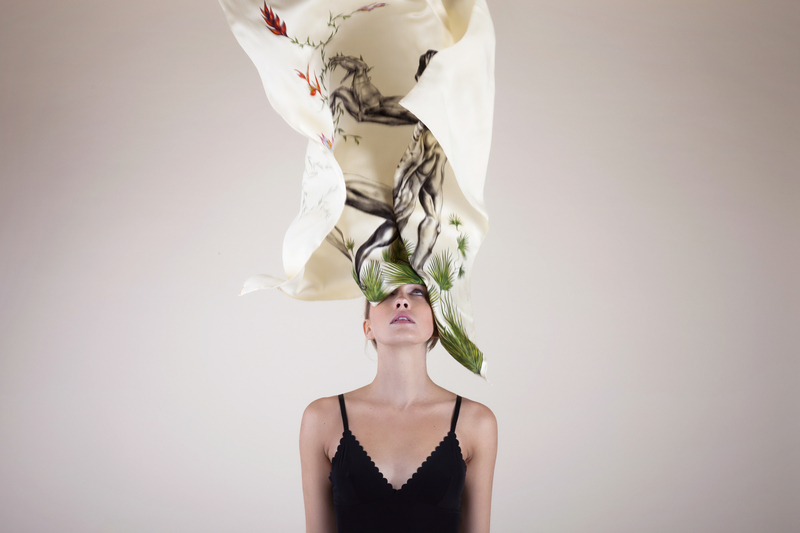 I’ve fallen in love with the enchanting designs and luxury silk scarves of Lidija Seferovic. The Croatian artist creates ‘wearable art’, re-imagining Greek myths which she hand-paints onto ivory and coloured silk. Born in Dubrovnik, but now living in London, Lidija Seferovic is a textile artist and fashion designer, renowned for her eclectic silk accessories. I found out a bit more about how she started and what inspires her stories on silk. Lidija Seferovic started her art career when she enrolled at the Luka Sorkočević Art School of Dubrovnik. It was here she was classically trained in portraiture, figure drawing, and sculpture. At the same time, Seferovic embraced her long-term love of fashion, which led her to embark on the State School of Fashion Design in Stuttgart, Germany, where she further honed her skills. Then moving to London, Lidija continued her studies at the London College of Fashion where she received a BA in Womenswear, after which she pursued a career in fashion. During this time, she designed, illustrated and embroidered for the likes of Alexander McQueen, Philip Treacy, Bruce Oldfield, and Ralph & Russo. Even now, Lidija is still heavily involved in the fashion industry alongside her art. Both Lidija’s designer scarves and textile art embrace a variety of techniques and mediums (oil, aquarelle, pencil) to project peculiar yet lively, imaginative stories onto stretched silk canvas. To date, most of Lidija’s work involves intricate studies of the human body, flowers, and nature. However, in the last couple of years, Seferovic has solely worked on depictions of famous Greek myths that she projects onto her silk scarves, accessories and bespoke wall hangings. Other classical creatures and figures who appear in her art include Dionysus, Pegasus, centaurs and griffins. Lidija declares that her aim is to “create items that not only work as incredibly stylish fashion items but also as pieces of art suitable for display alone, in their own right,” and that she does sufficiently. As well as committing herself to at least one collection of silk scarves and pocket squares a year, Lidija creates bespoke items and textile art for private clients on a by-commission basis. Rather than adhering strictly to the fashion or art calendar, Lidija creates collections at a pace that suits her lifestyle and experiences. According to Seferovic, “It starts with inspiration and extensive research, visits to museums and libraries, imagery from my travels and so on.” Traditionally, she then develops mood boards with the visuals, objects, and colours. Once she is entirely happy with the idea, the silk is selected, stretched onto a wooden frame, and the actual painting can begin. Each item can take between 4-6 weeks to develop, depending on the intricacy of the work. Having developed a penchant for the fictional and fantastical – tales of old and new – Lidija creates intricate, whimsical fabric wall hangings with unfolding stories that offer a revelation at every glance if you look for it. She specialises in “large wall art that makes an impact,” which is why most of her work measures at least 100 x 100 cm. The unique aspect of Lidija’s work is not only her distinct aesthetic but also the revelation that every piece of her work can be worn as striking style accompaniments to an everyday ensemble or displayed as wall art if left mounted on their batons. Often, Lidija will send a client a piece of work and it will be displayed for a short time before being removed from its batons and worn as a scarf. In this, Lidija’s work has reimagined the term ‘wearable art’ and is proving popular with clients across the world. All Lidija’s accessories and elegant silk scarves are available to purchase online. Her artwork can also be purchased through Saatchi Art or directly by emailing info@lidijaseferovic.com. You can also take inspiration over on Instagram. Which designs do you love most? Let me know!